Yowsa, time flies and all that. The last batch of Minechats I uploaded here on my blog went up to Episode 22. We are now up to Episode 25! With Episode 26 being filmed (on location!) this week. 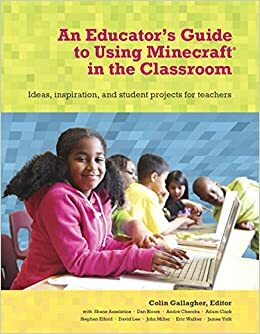 I’ve been busy using Minecraft with our Grade 1 and 2 students within their respective curriculum units but I will write up another post about that soon. I have to think about that one. It was fun though, I will say that! I will be presenting at the Digital Education Show Asia in Kuala Lumpur at the end of May. I’ll be hosting a round table with Adam Clarke about Minecraft in education and also presenting on how we leverage Google Apps for student portfolios at my current school. Come September, I will be making my first foray into Africa with the Learning 2.014 Africa conference. There I will be leading an extended session on Minecraft in education (or actually two of them I think). Anyway, on to the Minechats we have to catch up on! John has a great project going on in his school. His students learn about the Tang Dynasty and so what better than to learn about it creating appropriate ancient Chinese buildings in a Tang Dynasty Minecraft world. Adding on to that, students place information blocks outside each dwelling describing life inside and outside the building. Really engaging, really appropriate, and really relevant. Nick is a Grade 11 student in Australia who got his STATE’s Department of Education to open Minecraft for every school! He saw the need for teachers to learn about how to use Minecraft in education and has built a world to talk with and teach teachers. We were joined by two of those teachers; Suzie Feodoroff and Vivienne Tuckerman. Nick is a fine example of a self-directed and passionate young adult who enjoys nothing better than showing off what he loves to do. Andre is a teacher based in Denmark who uses Minecraft in teaching with special needs students. It was really great to see and hear what Andre was doing. David Lee has started out his Minecraft in Education adventure by using Minecraft PE on iPads (we’ll hear more about that in the future I’m sure) but now he has made a world in regular old Minecraft. His world is made to help teachers understand and learn about Minecraft. His world also has a recreation of a project he undertook with Minecraft PE about volcanoes and layers of the earth. He also has a electronic circuit area where he runs an after school club.